omid (mashhad, Iran) on 1 August 2013 in Architecture and Portfolio.
" گلدسته ها و فلک "
Nice picture. I've heard people talking about levitation on the mat when flying. One can, of course, say that a bird in the sky levitated over there, at least I think so. Wonderful amazing capture! I love the details and the bird in the picture! بسیار عالی شده مخصوصا رنگ ابی بگگراند با کاشی ها نمای زیبایی ایجاد کرده است. Une merveille, splendide architecture. Bonne journée. Somptuous colours here , with such a beautiful sky and the minaret get to it . WOW is is zo gorgeous, Omid! Wow, that tower is awesome! Wonderful decorations and colours. Stunning bright shot, wonderful contrast against the blue sky. Une magnifique architecture et un très bel angle de prise de vue. Les couleurs et les détails sont splendides. An excellent image! accompanied by an exceptional ... I like! Clever title with the bird in the frame. Your colors are superb here, Omid! Amazing shot against a beautiful sky!!! Lovely colours here !! اثر زیبا و در خور تاملی ست. آفرین! Une super contre-plongée dans un camaïeu de bleus magnifiques. Superbe, fantastic details and colors. Also a nice bird !!!! Love the bird on this great blue sky ! Wonderful !!! The perspective is excellent, from bottom to top. I love a lot that colorful tower, splendid, with stunning details. The bird is a good addition to this great image. Against that blue sky.... spectacular omid and that one little bird really stands out. 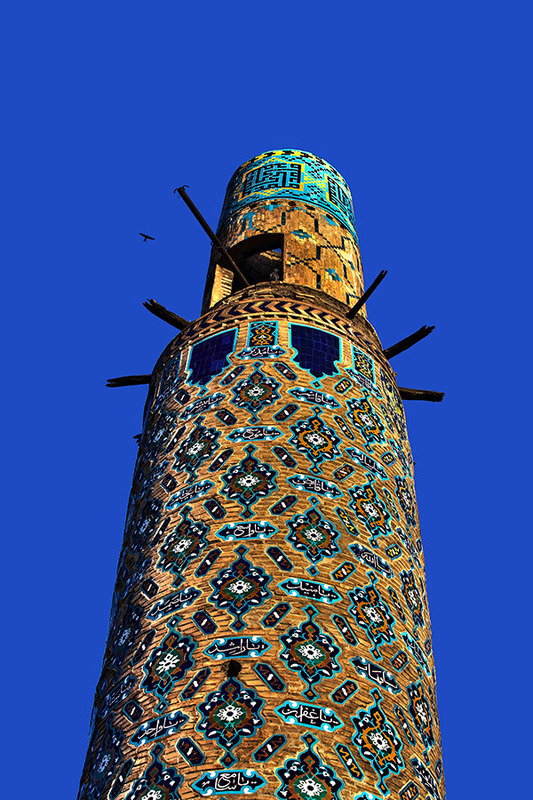 Beautiful colors and patterns in that tower, it looks like writing in the blue squares. An excellent view! Superb and funny title ! Woooow! This is lovely!! Nice colours and ornaments !! Fantastic architecture and colors! Very beautiful and stunning! el título... Espectaculares colores y luz..Saludos. khayli khoshrang va zibast ,,vozohe khayli khobi ham dareh. Stunning colors and design that stand out beautifully against that blue sky!! The colors and the artwork is just gorgeous. Beautiful image! Wonderful to see !! Great frame and super color !!! what a beautiful building. great capture of the detail, color and light.